Inspiration runs on its own schedule: great ideas don’t always arrive in a timely manner. Such was the case with [Daren Schwenke]’s notion for creating a 3D-printed blooming rose for his valentine, a plan which came about on February 13. Inspired by [Jiří Praus]’s animated wireframe tulip, [Daren] figured he could make a rose from clear printed petals colored by RGB LEDs. 24 hours seemed tight but sufficient, so he diligently set to work, but – after a valiant effort – finally had to extend the schedule. It’s now more than a month later, and tweaks to the design continue, but the result is nothing short of spectacular. We first saw a discussion of the idea over on Hack Chat, and followed as it evolved into a project on hackaday.io. There, you can read the full details of the trials and tribulations that had to be endured to make this project happen. From a printer that wouldn’t boot, through testing PLA, TPU, and nylon filament, trying a number of different approaches for springs and hinges to operate the petals, and wiring the delicate DotStar LEDs with magnet wire, you can get a really good sense of the amount of experimentation it takes to complete a project like this. If you know anyone who still thinks 3D printing is as easy as clicking a button, send them over to read the logs on this project. What finally materialized is a terrific combination of common hacker technologies. The petals are printed flat in nylon, then formed over a hot incandescent chandelier bulb. The stem and leaves are also printed, but the side stem has a piece of magnet wire embedded in the print as a capacitive touch sensor; when the leaf is touched, the rose blossom opens or closes. Magnet wire for the LEDs and a connecting rod for the mechanics run through the main stem to the base, where a 9g servo is responsible for controlling the bloom. The whole thing is controlled, naturally, with an Arduino. To move the project along a little more quickly, [Daren] enlisted the help of another Hack Chat denizen, [Morning.Star], who did an amazing job on the software without any access to the actual hardware. Be sure to check out the video of the rose in action, after the break. We’ve seen blooming flower projects around these parts before, including this lamp. This is pretty cool. I wonder if I could modify it to drop petals over the coarse of a day, week, month or so, a la Beauty and the Beast. 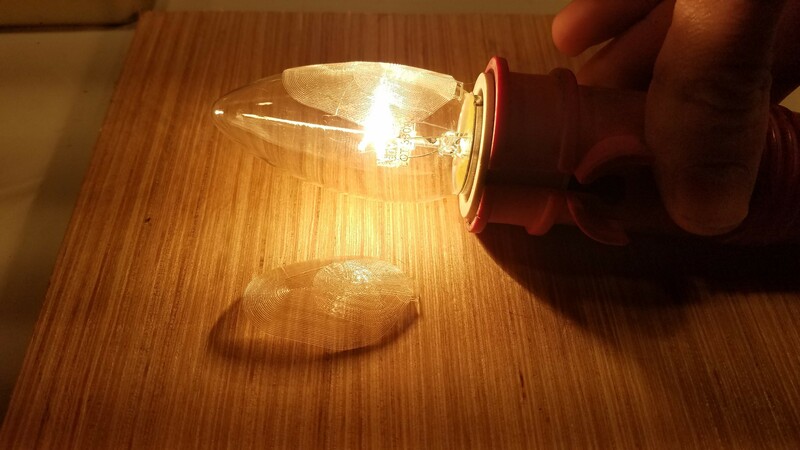 Two really cool techniques from the project page – formed the petals over a 40w lightbulb and set cura to only print infill. Yapo always doing cool stuff. Added bonus, he found the original project which inspired this so I could give him a shout-out. Thank you Ted. The mechanics are quite good. The sound, not so much. The startup sound is unavoidable as you don’t know the previous position. I assume the middle. Using a better quality digital servo would mostly solve the runtime noise. The existing one I used is about as cheap as they come. You can also adjust the open/close time in the code with a variable to make it move more slowly.